Reading the latest IndyWeek this morning with my coffee I stumbled upon my horoscope. Ok, I didn’t stumble upon it… I purposefully sought it out and read it…. Nonetheless, I felt compelled to share it because I definitely needed to receive this planted suggestion this morning. 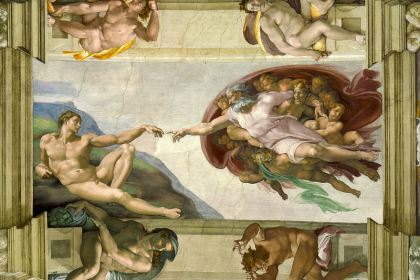 Philosopher William Irwin Thompson says that we humans are like flies creeping along the ceiling of the Sistine Chapel. We literally cannot see the splendor that surrounds us. As a result, we don’t live in reality. We’re lost in our habitual perceptions, blinded by our favorite illusions, and addicted to beliefs that hide the true nature of the universe. That’s the bad news, Libra. The good news is that every now and then, each of us slips into a grace period when it’s possible to experience at least some of the glory we’re normally cut off from. The veil opens, and previously undetected beauty appears. The weeks ahead will be the closest you’ve come to this breakthrough in a long time. A perfect example of this shortsightedness has been my summer so far, my summer that is almost over: I have been so hyperfocused on the work list I need to do this summer for my other job and its heft and length, the unfairness of this, and the minutia required to either work at chunking off sections or avoid tackling it at all, that I have missed so many opportunities to enjoy simple splendors surrounding me. I have been that fly crawling around on the Sistine chapel, unable to see anything except menopause webpages, files in black notebooks, and small avenues of temporary escape. So, starting today, I plan to back it up and take notice of the beauty around me at any given moment. There is too much negativity out there. Folks need to stop complaining and count their blessings, stop looking at everyone else and judging them, etc. Who is perfect? Be happy, peeps. AND, if you took a vacation this year… what do you have to complain about? Nothing. Nada. Smile already. Oh, and stop watching Fox News, yo. That was on at the gym this morning and all they did was spew more negativity, but the Today Show was highlighting the Olympics and I would have much rather watched that because that, my friends, is a positive. Positive begets positive. Add more happy to your life. Happy = GOOD! Dawn is on point. This is my second vacation this summer. I have nothing to complain about. I am happy and that equals good.